Amongst all my fabulous Christmas Gifts, was this cookbook. 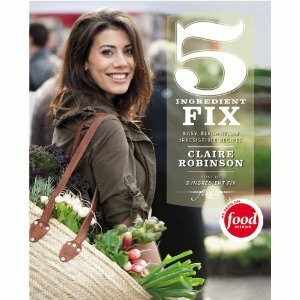 The 5 Ingredient Fix by Claire Robinson. I liked her right off the bat after I found out she was good friends with Katie Lee (formerly Joel), one of my favorite cookbook authors. This cookbook is awesome! I was skeptical at first, I mean how great can meals with only 5 ingredients be? But, Claire does not disappoint. The first recipe I tried out was for Brown Butter Banana Muffins. Do I have your attention now? Not only were these muffins so easy to make but the brown butter gives them an incredibly rich flavor. I really liked that they were not sweetened with sugar, but agave nectar instead. Made me feel better about eating 5 at once. Preheat the oven to 375 degrees F. Line a 12-cup muffin tin with paper muffin liners. Peel the bananas and add to a large bowl. Add the agave syrup and mash the bananas with a fork until very liquefied but still a little lumpy. Melt the butter in a small saucepan or skillet over medium heat. Cook, stirring occasionally, until the milk solids have turned a nutty golden brown. To the brown butter, add about 1 cup of the mashed banana mixture and whisk to combine. Cook for a few more minutes until a darker golden color is achieved. Add to the remaining mashed banana mixture and whisk to combine, then whisk in the egg. Fold in the flour, in 2 batches, with a rubber spatula, until just combined; do not over mix. With an ice cream scoop, evenly divide the batter among the muffin tin cups. Bake in the center of the oven until golden brown and the tops spring back when pressed, about 25 minutes. Cool for 5 minutes in the pan, then transfer the muffins to a rack to cool completely. Serve warm or at room temperature. Brown Butter Banana Muffins!! Oh you are talking my language!! I wish I had this recipe yesterday! i just made banana nut muffins, but these looks so much better! Don't you love agave nectar? I do! I will def be trying these! Thanks for sharing! I just came across your blog and I LOVE! :) Im your newest follower!!! I like Claire Robinson too. I think she's confident and cute, but not pretentious at all. Do you like the rest of the cookbook? oooh, those look so yummy!!! I'm going to make these today!! The great recipes you share with us NEVER dissapoint! Miss you and your sweet baby!! Almost 1!!!! Hi I'm a new follower, just found your blog! I live in Charleston too. Always fun to find fellow Chs bloggers. Your little boy is sooo cute! mmmmmm! Those look darn good!! she already have a book? where have i been? thanks for sharing! one of these would have been perfect with my wine hangover this morning. too bad you don't deliver. Had one of these muffins from Chef Natalie and they were YUMMY!!!! 11 Months, I Think He is Mine!